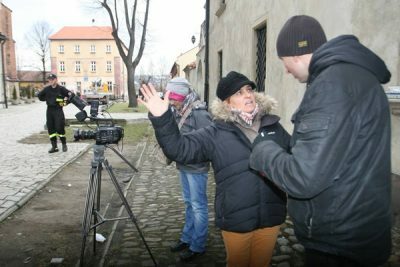 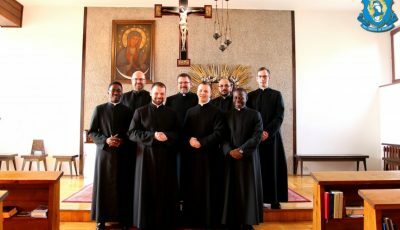 One of Warsaw’s film crews is filming a documentary about Fr. 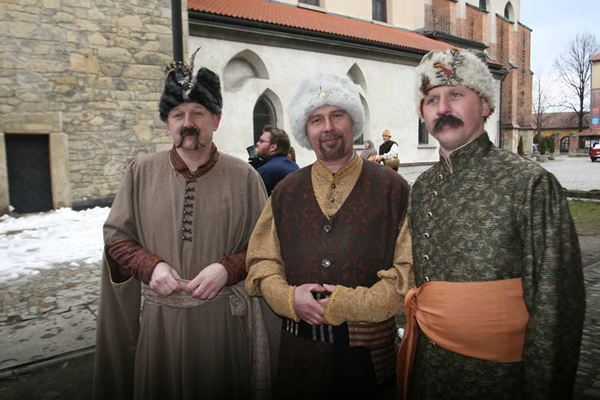 Stanislaus Papczyński in Nowy Sącz and the municipality of Podegrodzie. 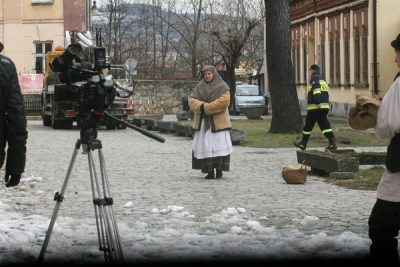 The film should be ready in late spring. 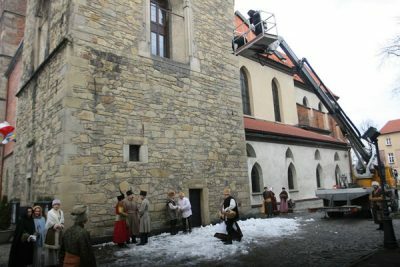 Recently, the crew worked in Nowy Sącz near St. Margaret’s Basilica and the Gothic House, the seat of the Regional Museum. 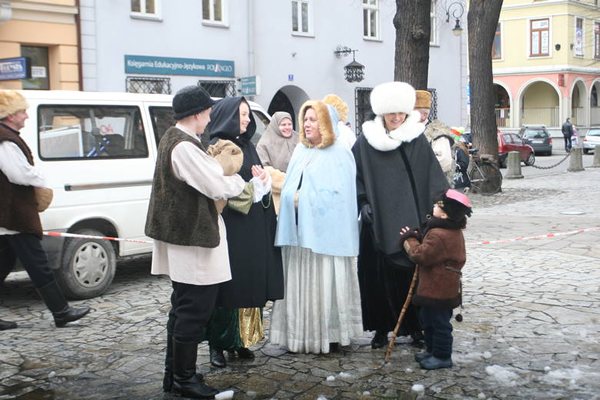 This corner of the city excellently renders the atmosphere of Lviv, to which Fr. 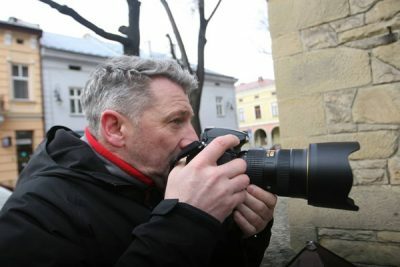 Papczyński travelled twice in his life. 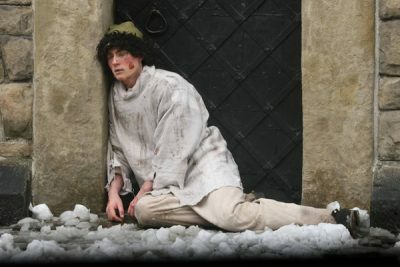 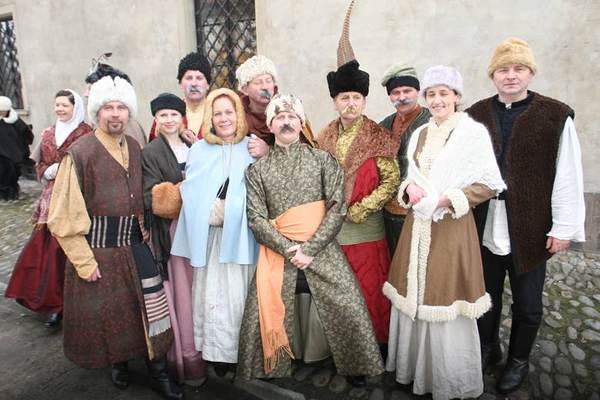 More than 20 extras — residents of Podegrodzie, Olszana, Podrzecze, Juraszowa, and Mokra Wieś — joined Ignatius Martusewicz, a Warsaw theater actor who plays the role of young Stanislaus Papczyński, in this production. 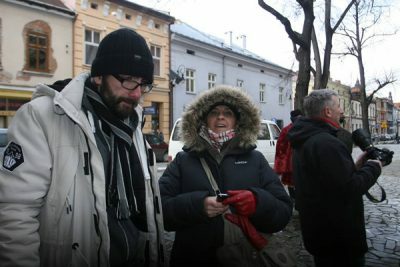 They arrived at the setting together with Krzysztof Bodziony, director of the Municipal Cultural Center in Podegrodzie. This documentary, intertwined with the re-enactments, has been commissioned by the Congregation of Marian Fathers, which Fr. Papczyński founded. He spent 24 years of his life in that Marian community. 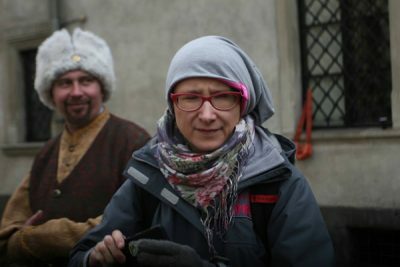 The film is directed by Agnieszka Dzieduszycka-Manikowska. 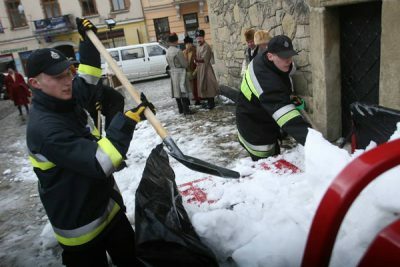 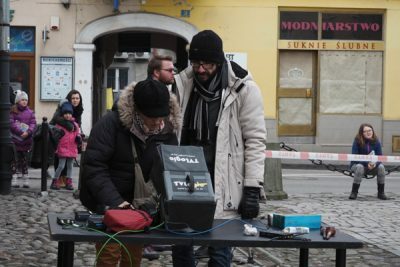 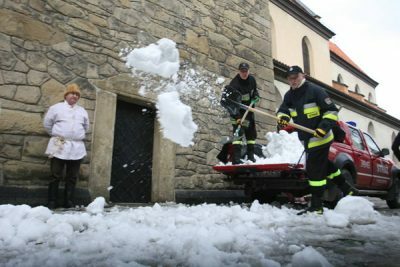 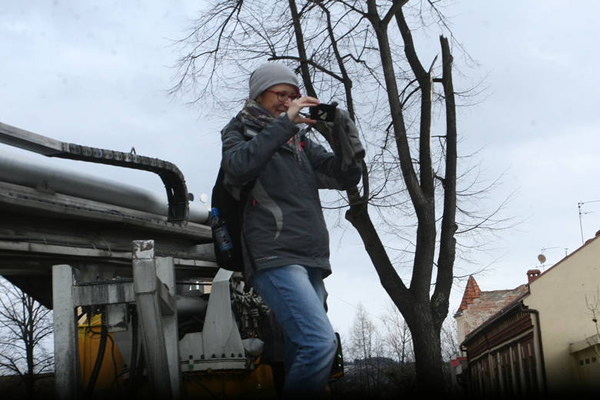 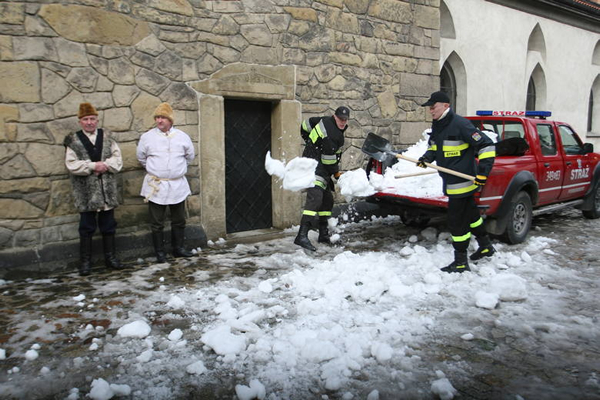 Filming of the Collegiate Square in wintertime was made possible thanks to the help of firefighters from VFB Podegrodzie, who fetched real snow, collected in Brzezna-Litacz, to Nowy Sącz. 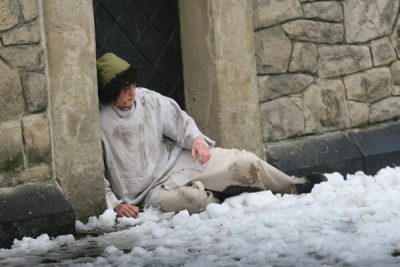 However, the film crew was prepared for any contingency, and artificial snow was ready and waiting. 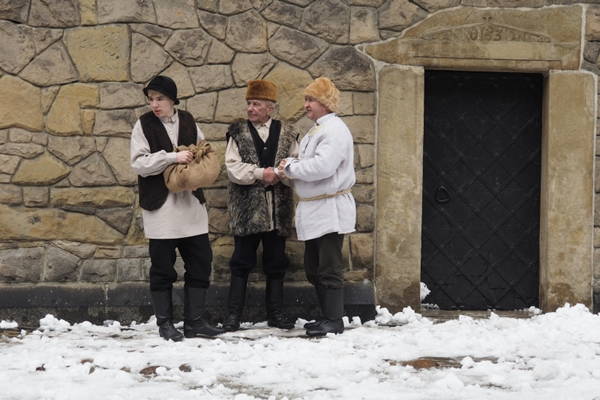 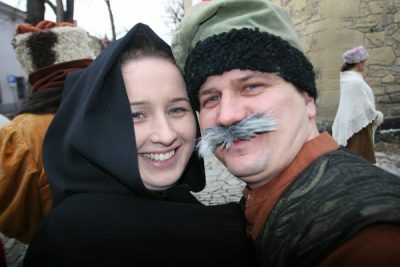 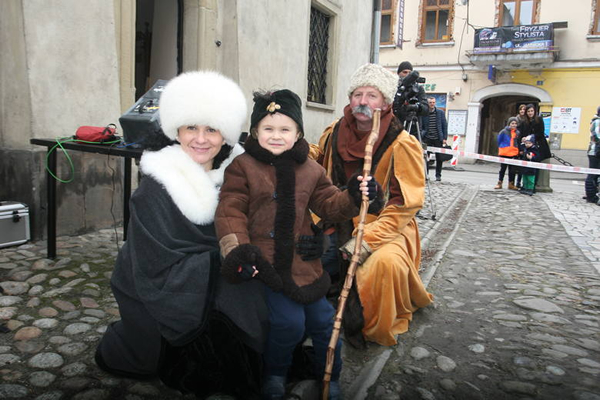 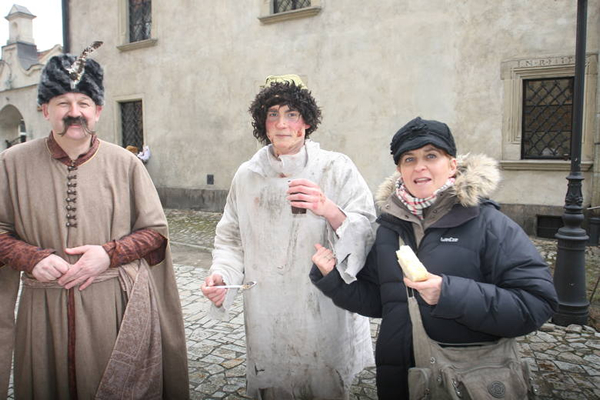 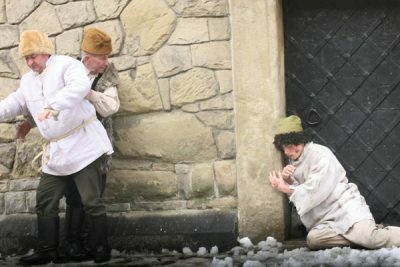 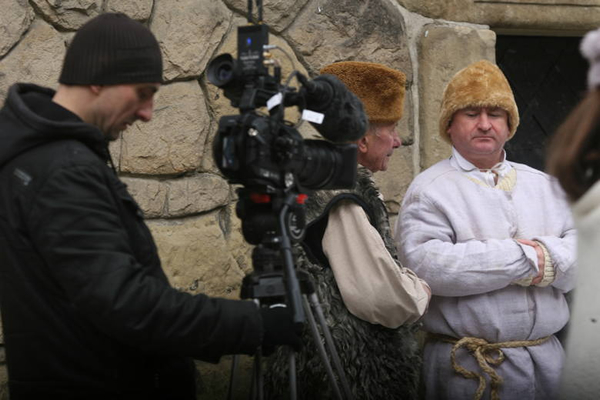 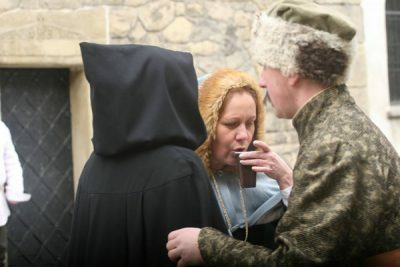 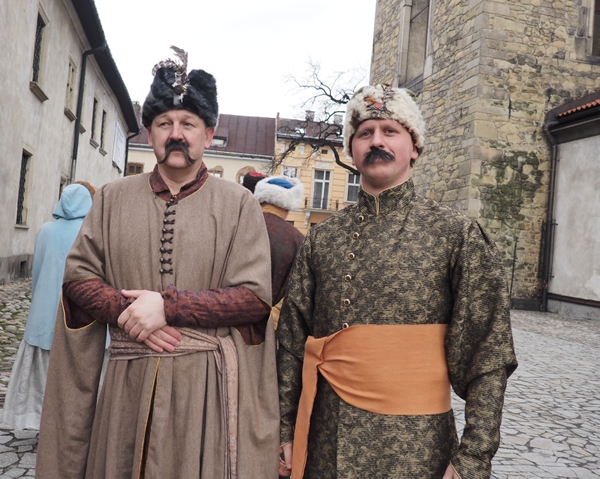 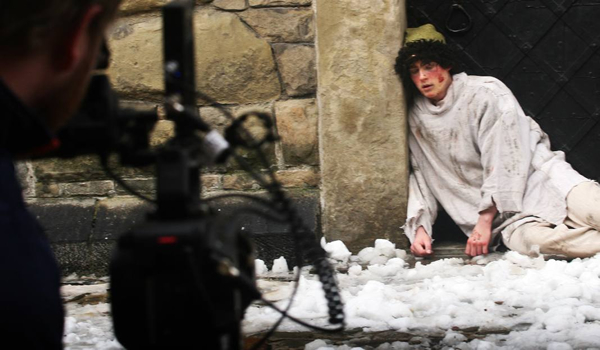 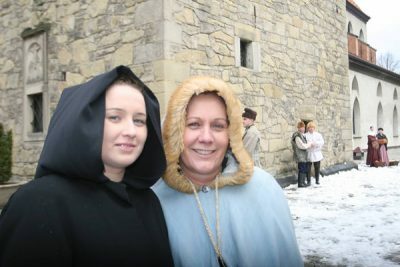 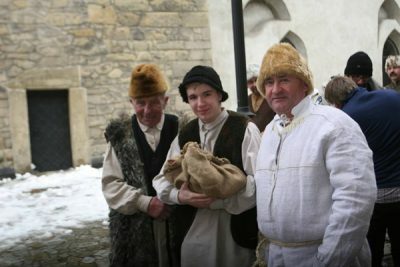 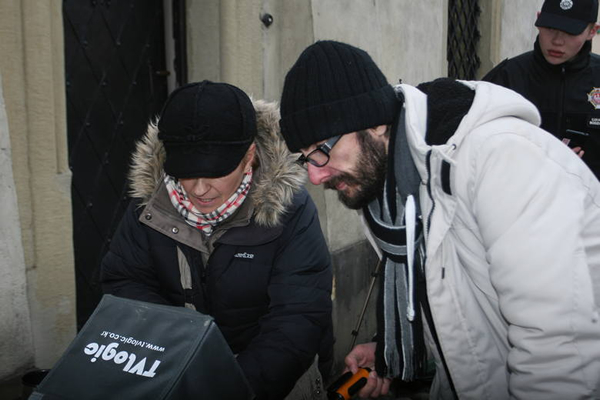 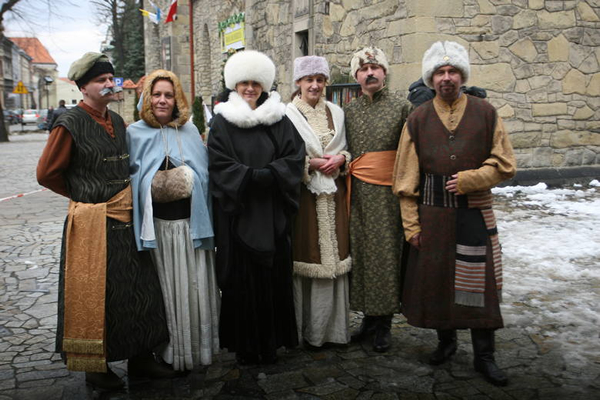 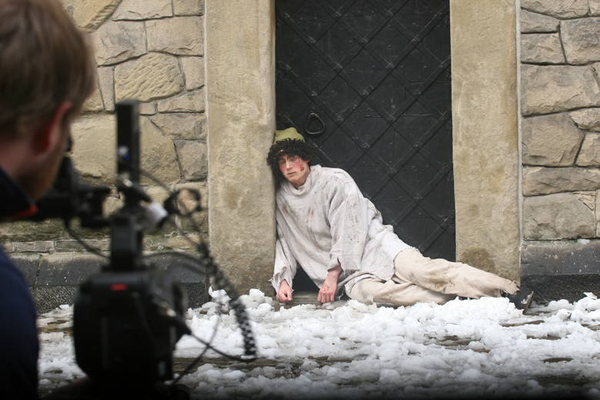 The production crew will return to Nowy Sacz again in mid-March. 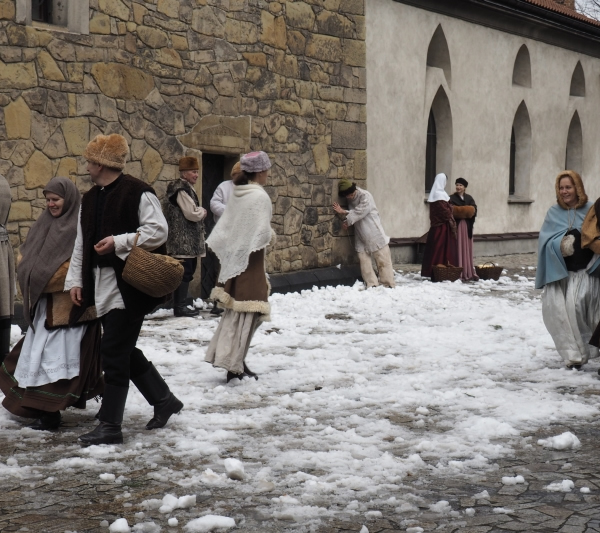 With the kind permission of the management of the Regional Museum in Nowy Sącz, they will be filming in that open-air museum. 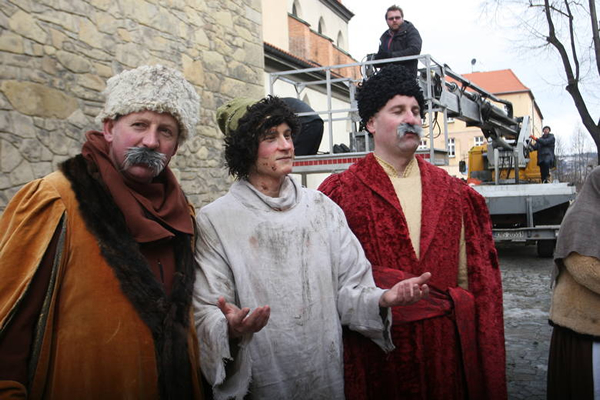 Four different people will be playing the part of Stanislaus Papczyński in this 40-minute-plus fictionalized biography. Viewers will see him as a child (played by a teenager), a young man, and an adult. There is a chance that the documentary about Fr. 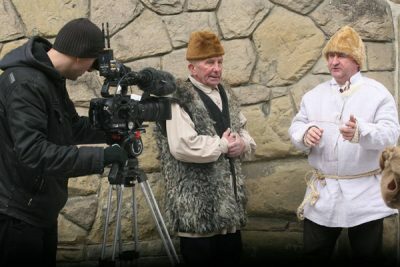 Papczyński will be aired by Channel One of Polish Television. 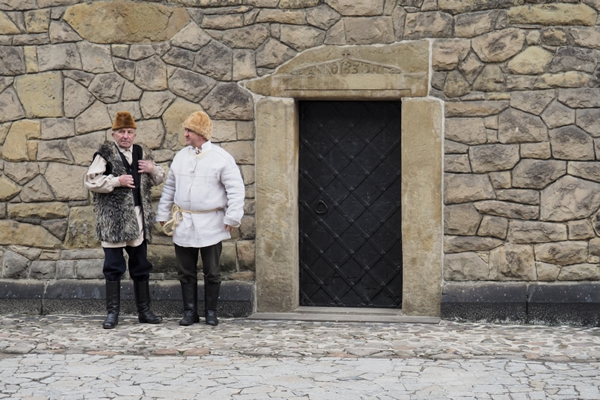 Talks are in progress. 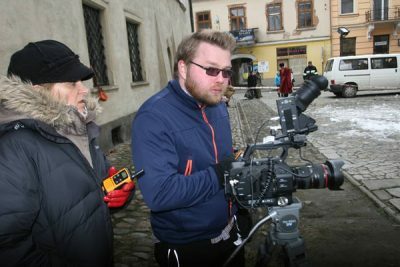 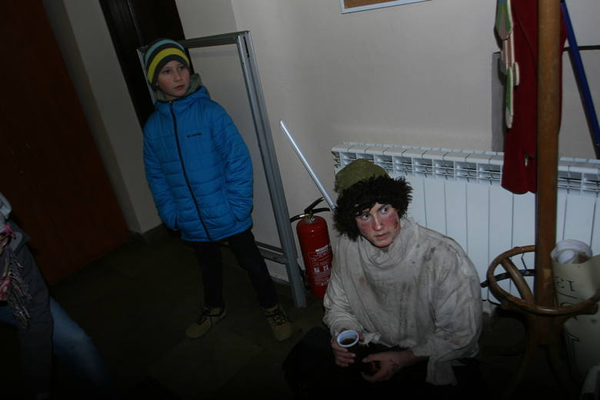 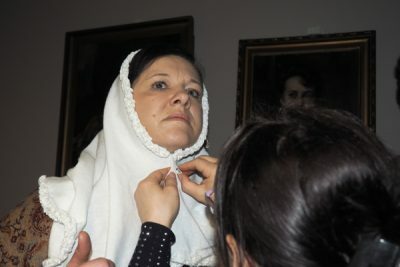 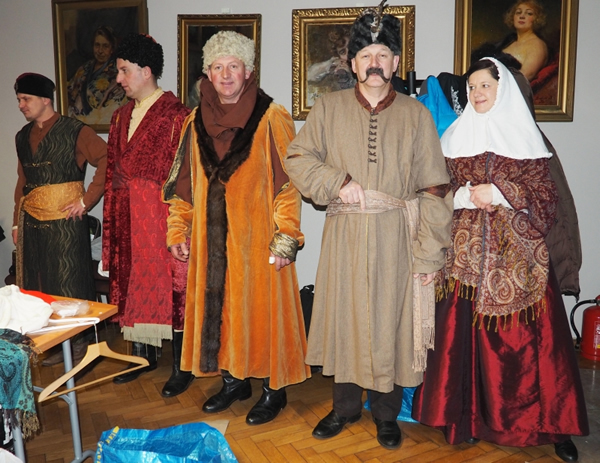 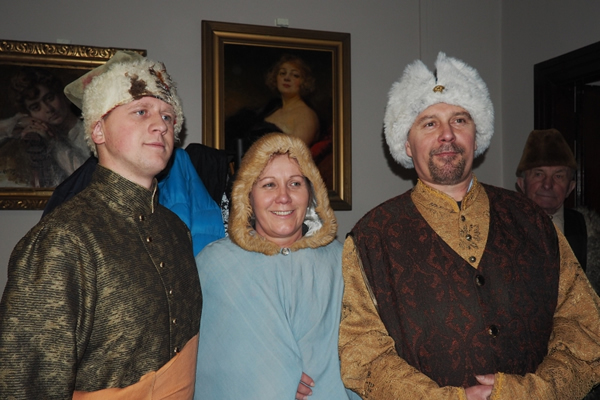 Krzysztof Bodziony, director of the Municipal Cultural Center in Podegrodzie was among the 20-plus extras — residents of the municipality of Podegrodzie — participating in the production. There was also Urszula Bodziony from Podegrodzie. 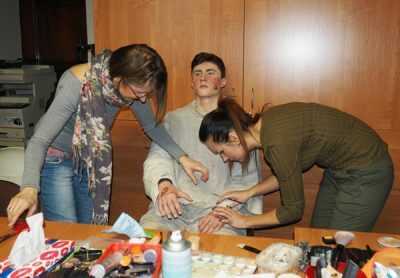 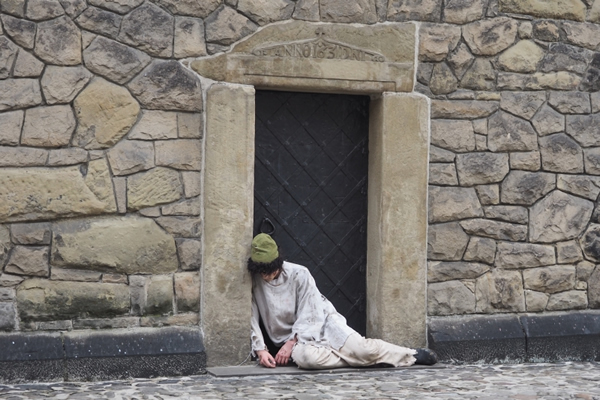 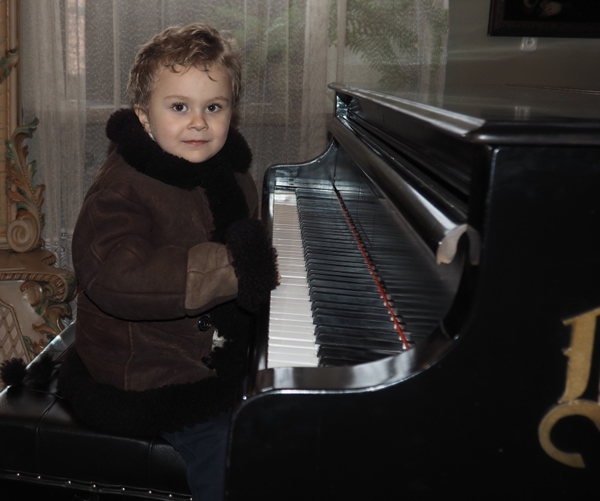 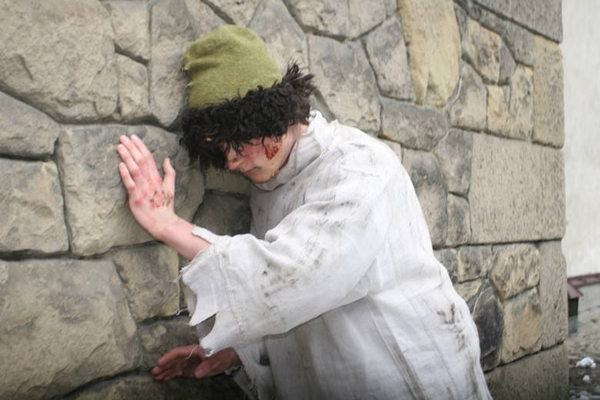 Ignatius Martusewicz of Warsaw recreates young Stanislaus. 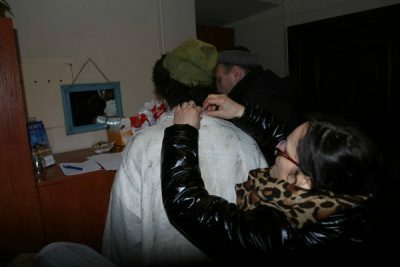 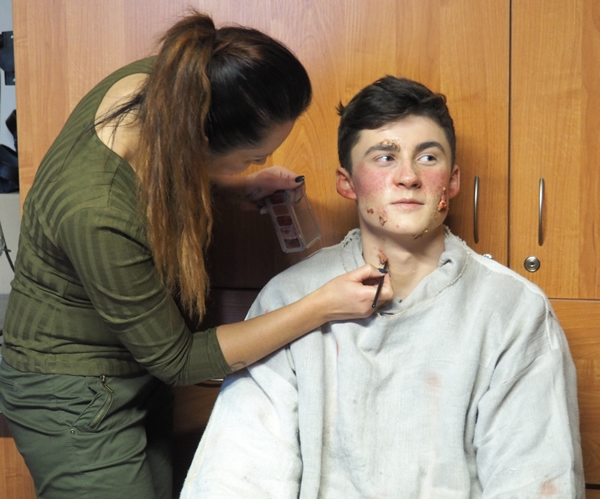 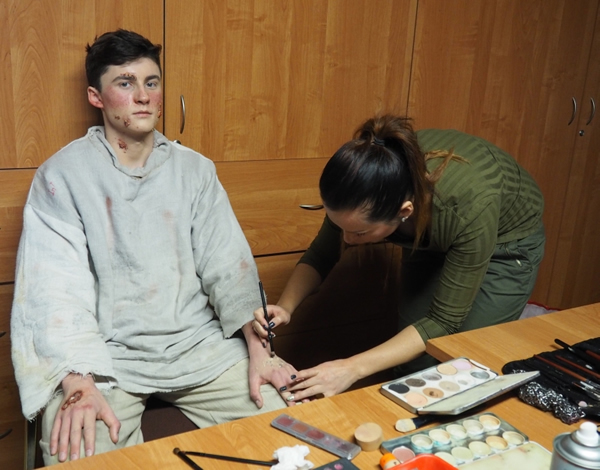 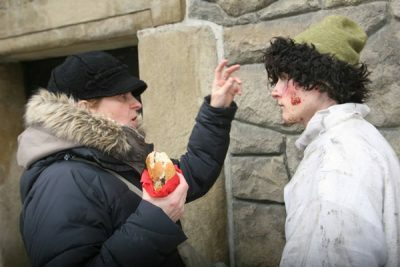 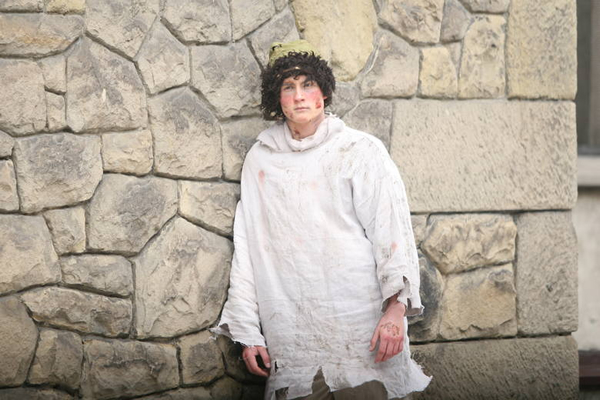 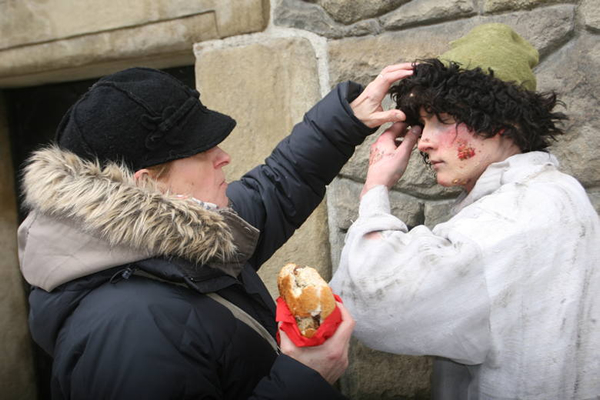 Prior to appearing on the set, he patiently undergoes the necessary make-up process. 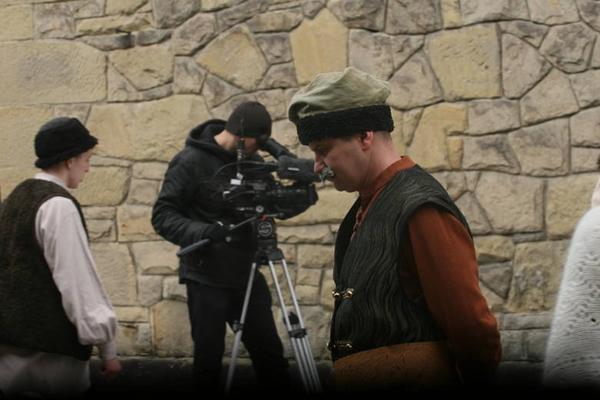 Ignatius Martusewicz spent a lot of time preparing for this role to best portray this character. 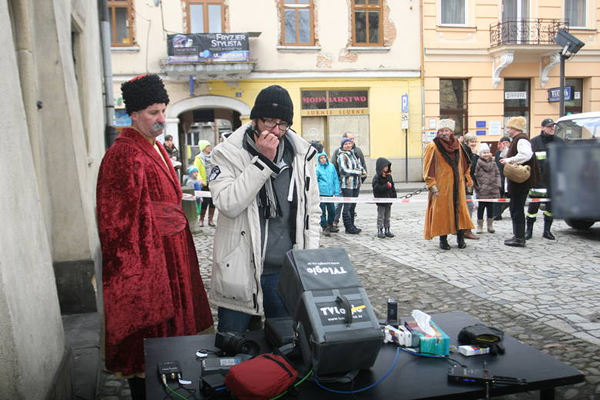 He has read a lot about this religious from Podegrodzie. 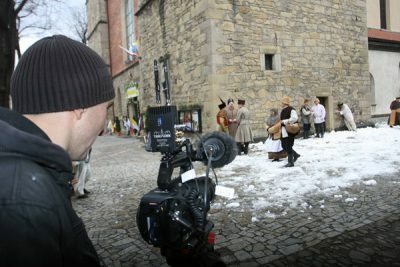 Many city residents came to the Collegiate Square to watch with curiosity the production crew at work. 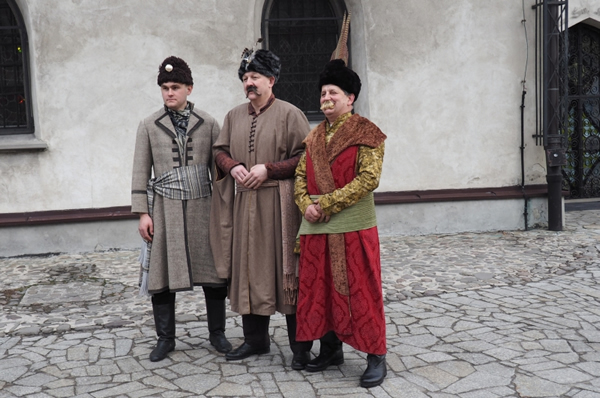 Reverend Jerzy Jurkiewicz, curator of the Shrine of the Transfiguration, was among them. 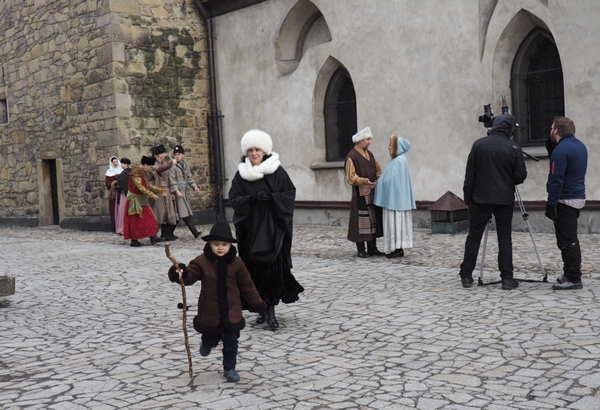 This is yet another movie filmed on the premises under the care of the Regional Museum in Nowy Sącz. Father Stanislaus Papczyński was born on May 18, 1631, in Podegrodzie. 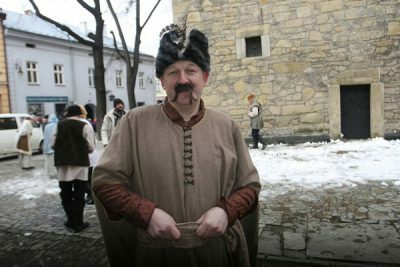 He was educated in Jesuit and Piarist colleges. After completing his education, he joined the Piarist Fathers due to their Marian character. In 1661, he was ordained a priest. 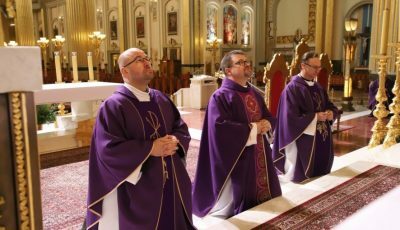 Twelve years later, he founded a new Order, the Congregation of Marian Fathers, to which he assigned the task of spreading devotion to the Immaculate Conception of the Most Blessed Virgin Mary, praying for the dead, and helping pastors. 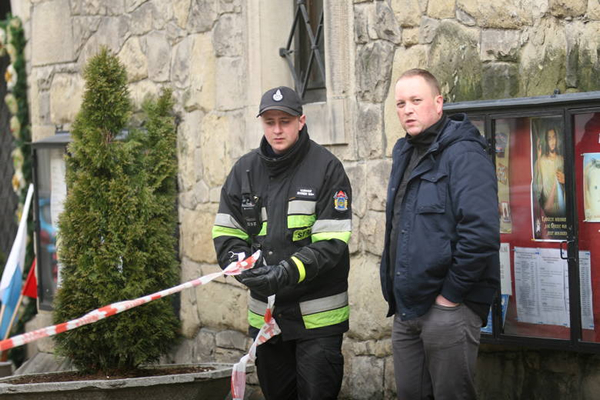 He worked as an educator and was known as a valued preacher and teacher of rhetoric. 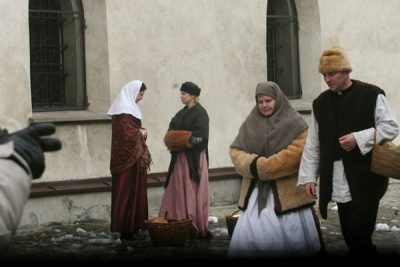 He died on September 17, 1701, in Góra Kalwaria near Warsaw. 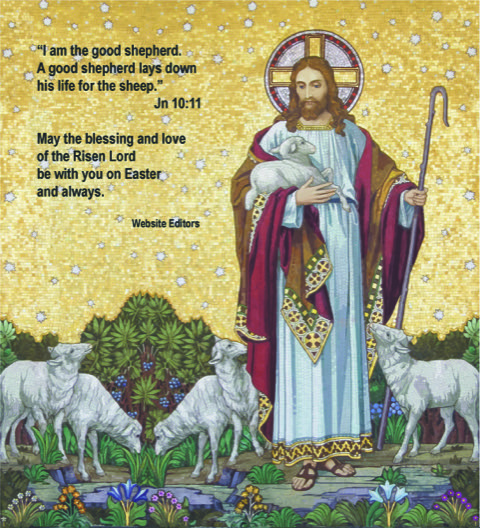 The news of his death spread like wildfire, and crowds of the faithful began to come to his tomb. Everyone believed that he was a great saint, healer, miracle worker, mystic, visionary, and inspired preacher. 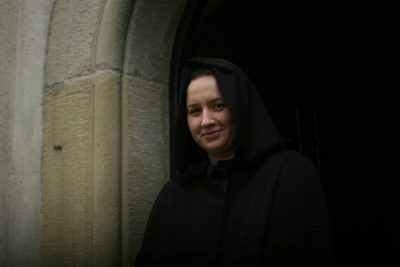 The poor mourned particularly their comforter who had always served them with good advice. In 1764, the Coronation Parliament of King Stanislaw August Poniatowski sent to the Holy See a petition asking for the elevation of Stanislaus Papczyński to the altars. 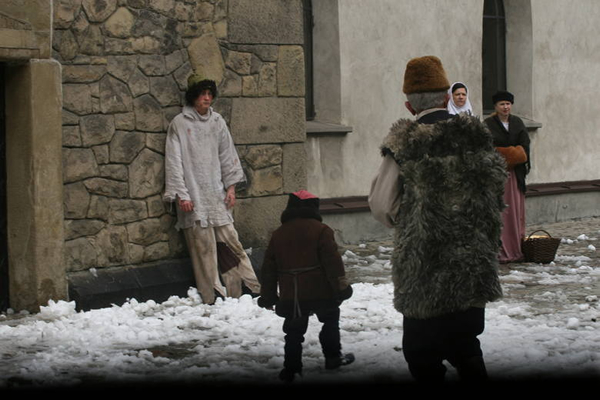 His beatification took place on September 16, 2007, at the Marian Shrine in Licheń. 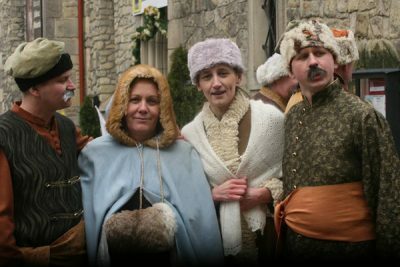 On January 21, 2016, Pope Francis authorized the Congregation for the Causes of Saints to publish a decree recognizing the miracle attributed to the intercession of this Polish religious.